Travels along expressways in Northern Luzon and the Manila to Cavite area will soon become much more convenient following an agreement recently forged between BDO Unibank and Easytrip Services Corp., an electronic payment provider to toll operators. Under the memorandum of agreement (MOA) signed by BDO and Easytrip, the bank will provide Easytrip's payment requirements, both to its suppliers and employees, through BDO's check printing and ATM payroll services. In addition to this, BDO Executive Vice President and Transaction Banking head Edwin Romualdo G. Reyes said the benefit of this MOA extends to the motorists-users of radio frequency ID (RFID) stickers who regularly travel along the North Luzon Expressway (NLEX), Subic-Clark-Tarlac Expressway (SCTEX) and Manila-Cavitex Expressway (Cavitex). The BDO-Easytrip agreement allows easy reloading of RFID stickers through BDO's online and mobile bills payment facility, including over-the-counter payments at the nearest BDO branch via the bills payment facility. The RFID stickers, dubbed as Easydrive, are interoperable within NLEX, SCTEX and Cavitex. "The MOA between BDO Unibank and Easytrip Services Corp. can help not only Easytrip, but also its 500,000 motorists who are RFID users, in conveniently reloading their RFID cards though BDO’s bills payment service," he said. BDO has been Easytrip’s partner bank for cash management services since early 2017, from deposit pickup to collections from their customers, and to payments to their employees and suppliers. For his part, Easytrip President Eugene S. Antonio said the partnership with BDO provides that much needed reloading facility that they have long been looking for. "We are thankful that we are now part of the BDO ecosystem, so this is going to be a milestone for our customers," he said. "You need people who share the same advocacies that you have in delivering public service to the people. We are lucky enough to find that in a company that is always finding ways on how to deliver these products. We can say that the next trip of these customers will be an Easy-trip." BDO signs CMS MOA with Easytrip. 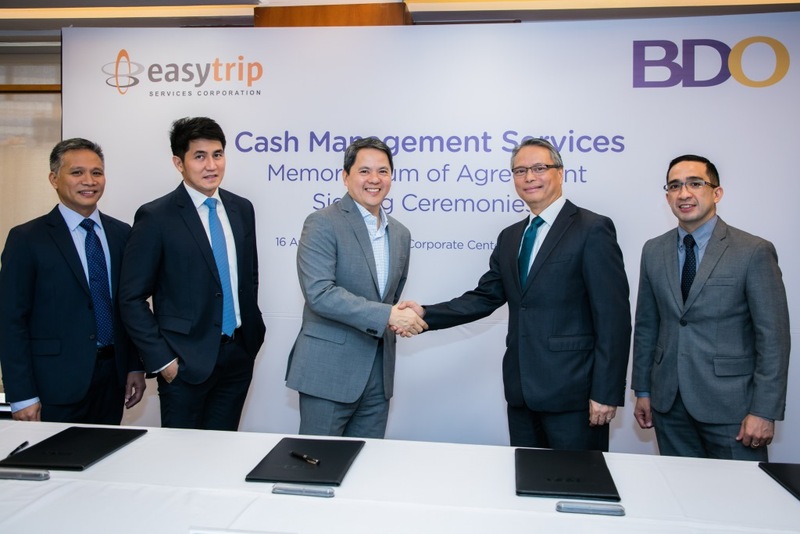 BDO Unibank recently signed a Cash Management Service Memorandum of Agreement with Easytrip Services Corp., wherein the bank will provide Easytrip's payment requirements both to its suppliers and employees. Present during the signing ceremony are (left to right) Roberto V. Bontia, Chief Tollways Operations and Technology Officer of Metro Pacific Tollways Corp. (MPTC); Christopher C. Lizo, Chief Financial Officer of MPTC; Eugene S. Antonio, President and General Manager of Easytrip; Edwin Romualdo G. Reyes, Executive Vice President and Transaction Banking head of BDO; and Edgardo R. Marcelo, Jr., First Vice President and Transaction Banking segment head of BDO.